The equinox has just passed, and so the days are (just) longer than the nights and we move towards another spring and another summer. The change in length of the days and the nights is predictable, like the ebb and flow of the tides. But will the longer days lead us into a blazing hot summer or a disappointing, wet one? That we cannot know, not in the UK at any rate. The pattern of days and nights is constant, a sine curve of longer days, flattening out until gradually the days shorten, accelerating towards the equinox and then moving into a mirrored pattern of longer nights. 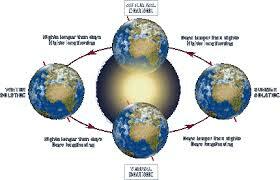 The pattern is dictated by the movement of the earth around the sun – by external forces. As humans, we are also affected by external forces – indeed some people believe that sun and the moon are significant influences on us, as they are with the days and nights and tides. But other forces are at work as well – our environment has a big influence on us – what others are doing around us; the way a room is decorated; the sounds we hear; what we smell – all these things influence our moods. People differ in this regard; some people seem, for example, to be strongly influenced by the weather while for others it seems to make little difference to their mood. Many of these external forces are beyond our control, but some are not. For example, rearranging furniture or redecorating a room may be things we can decide to do and act on. And certainly most of us are able to control what we eat – and undoubtedly this will affect our mood and our behaviour to some extent. There is another, significant, level of control we have over our moods, which distinguishes us from the days and nights, or the oceans which are pulled by the moon, whether they like it or not. As human beings we have free will – self-determination – we can make decisions and instigate changes. We can control what we eat, but more than that, we can control how we react to external forces. We might be angered by a traffic jam, or frightened by a spider, or find ourselves saddened by the memories a piece of music holds. We can’t necessarily control these feelings (and may not want to) but we can control how we react to them. In the traffic jam we can shout and scream and beat our fists against the steering wheel, or we can take a deep breath and put on some soothing music and wait for the traffic to clear. 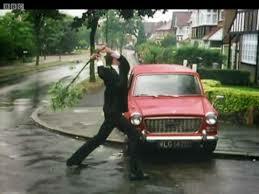 I am reminded of John Cleese in Fawlty Towers, thrashing his broken-down car with the branch of a tree. Such a ridiculous waste of energy is hilarious, and yet we all do this, I think; we all react, at times, in ways that are inappropriate, unhelpful, even damaging to ourselves and to others. It seems to me that as we develop as human beings we assemble a toolbox – a set of strategies that we use to cope with different situations – with different emotions. Most of the time we can find the right strategy to cope with a given situation but sometimes we find that the emotions are too strong for our toolset – As Basil Fawlty often does – or we find ourselves experiencing feelings that we’ve never dealt with before, that we lack the right tools to deal with. But one of our great talents as humans is our resourcefulness, and I think that there are always ways of dealing with new and difficult situations. The tools that we have may not work exactly as they are, but they can be adapted, we can develop something we used before, we can combine some different techniques, we can improvise. The days and nights have no tools at their disposal, they are completely at the mercy of the sun and the earth. The tides are dictated by the moon. For us, there are many things that we can’t control, but there are many more things that we can control. 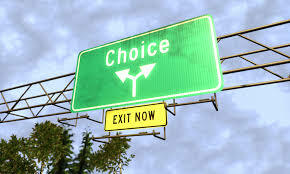 Choice is, perhaps, our greatest asset. This entry was posted in Looking After Yourself, Making changes and tagged behaviour, change, choice, control, decision, emotions, feelings, power. Bookmark the permalink.